Feedback. We get and give feedback all of the time. Some verbal, some non-verbal. A raised eyebrow can speak volumes and be very, very effective. With students, feedback can seem illusory, non-committal, useless. Grades are something to which students and parents can respond but, in the grand scheme of things, a grade doesn't tell me much. 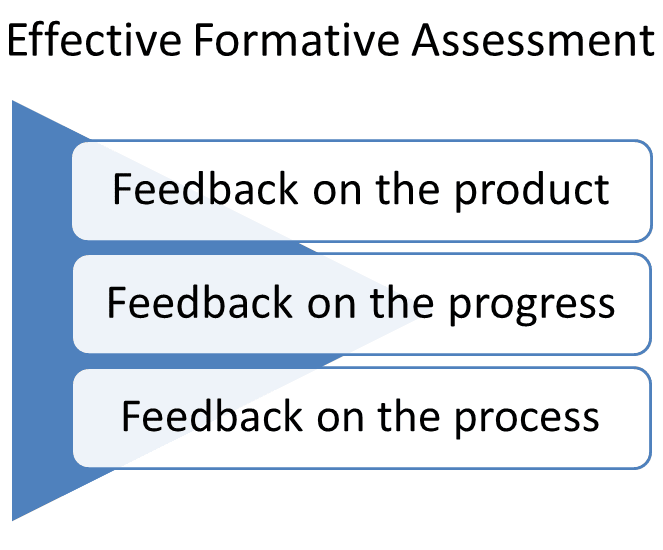 In education we make much about formative and summative assessments. I'm not going to talk at all about summative assessments because, in my opinion, most of them are simply a test of a student's ability to recall stuff. Especially if the test is multiple guess and true/false. Those provide students with a grade but offer the students zero insight into what they know and can do. I've done a couple of posts (and podcasts) on accountable talk and collaborative learning strategies. Accountable talk provides opportunity for effective feedback in that students can measure what they know and can do against expectations and standards/learning targets. . . provided, of course, the expectations and standards/learning targets are clear, but that's a different though profoundly importantly-related issue. Effective depends on not only how, but what. 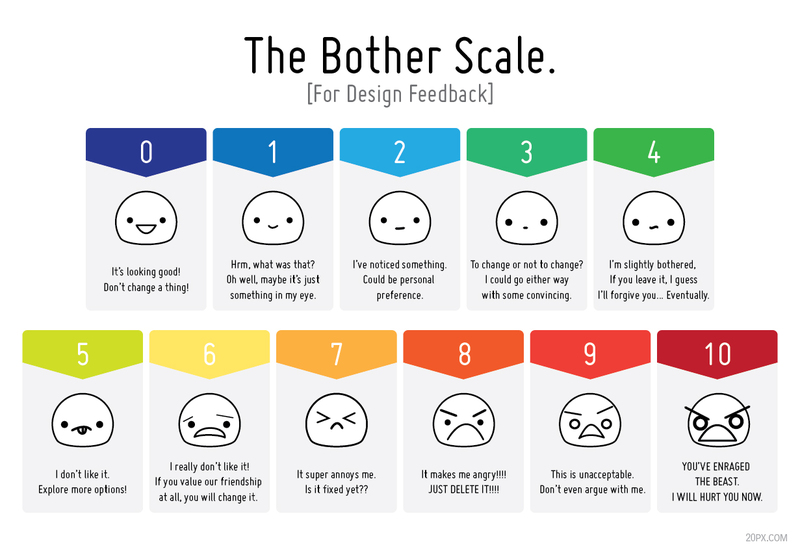 Consider the graphic for feedback on the product, the progress, and the process. Think any content area at any grade level. The student completes a task or assignment producing a product that is handed in or somehow shared for assessment. That work marks progress towards proficiency of the standard or towards meeting expectations for that learning experience. That work also demonstrates the approach the student takes towards making progress in the product of that process. Think about how commenting on each could make a difference. "Well, Zaphod, we'll need to review the product but I can see what you did and how you did it. Perhaps you can walk me through these steps (paragraphs, ideas, notes, references, whatever)." That's an exaggerated response, but the point is that effective formative assessment moves a student forward; it does not stop him in his tracks and leave him flailing and wondering what to do next. 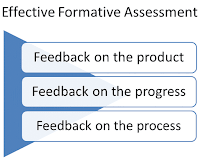 Effective formative assessment lets the student where and how she's been successful and provides her with the wherewithal to start to figure out what she needs to do to proceed. Teachers cringe at that sort of thinking. Their verbals and non-verbals are quite clear as they wonder how the heck they will find the time to provide that kind of feedback to students. Well, change the mechanisms used for assessment. Read this article by Vicki Davis. She's talking about formative assessment. Yes, she refers to a digital tool (Socrative is cool), but the point is that she was able to reduce the amount of time spent on a particular topic by two full days. How? She listened carefully, she paid attention to verbals and non-verbals, and she offered students opportunities to demonstrate their learning and assess their own progress. This article is mostly about educational technology, but I was stopped by this notation and the influence of feedback on student learning. can influence student outcomes (p. 6). Hattie goes on to note that expert teachers are more flexible and better at problem-solving; they are more opportunistic and take advantage of new knowledge and the situation. Expert teachers are also more adept at anticipating problems and improvising. The explanations of and examples for these dimensions is fascinating reading. It suggests to me that feedback is much greater and grander that grades or even comments on a paper. It's more profound than the probing questions. It's more significant that helping students recognize the problem, challenge, or impediment and figure out how to move past it towards proficiency and meeting expectations. Expert teachers aim for more than achievement. They also aim to motivate their students to master rather than perform, they enhance students' self-concept and self-efficacy about learning, they set appropriate challenging tasks, and they aim for both surface and deep outcomes (p. 10). Effective feedback is a teacher's response to student work using criteria for good work that were part of the learning target. Effective feedback observes where the [student] did a good job of meeting the criteria and where [the student] did not. Effective feedback suggests ways the student could go about understanding the reasons for these observations, building on strengths and improving weaknesses (Advancing Formative Assessment in Every Classroom, 2009, p. 45). In Transformative Assessment (2003), Popham talks about feedback as a process for teachers and students. The expert teacher, in my opinion, can offer effective feedback while attending to affective attributes--showing students how to think about their own thinking and learning, how to use and develop their self-awareness, and how to examine their own work and progress in context of the stated expectations and learning targets. Okay, so what? Well, it's probably obvious that many teachers need to rethink how they approach and implement formative assessment. Getting kids involved by using Kahoot! may be fun and engaging, but it's only one approach. The other thing I kept thinking about as I meandered down this path is feedback in the work place. I could launch into something long-winded and potentially interesting, but I'll just say this. We all want effective feedback as described above. We all want to know what we're doing well and where we need to improve. We all want to know our boss's or manager's expectations and the work targets. And we all want our bosses to see us as more than just a cog in the work place machine. Empathy and authenticity. Maybe they really will be the words and ideas of 2016. . .in the classroom and in the work place.